Spider IV 15 guitar amplifier from amp-modeling pioneers Line 6 delivers best-selling rock star tones. Feast your ears on industry-leading Line 6 amp and FX modeling, dialed-in tones and presets, and much more. Plug into perfectly distilled collections of American and British amp tones, paired down to the very essentials. Spider IV 15 gives you access to a variety of tones that every guitarist wants. Shimmering clean tones, a classic crunch inspired by a 100-watt Marshall Plexi, punchy high-gain heaven inspired by a Mesa/Boogie Dual Rectifier, and more. 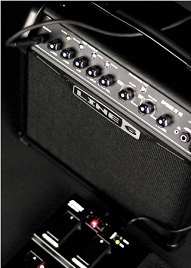 The Spider IV 15 also boasts Insane, one of their most popular amp models. Dialed in for shredding, Insane is lean, mean and loaded with distortion. Spider IV 15 features 4 amp models: from clean jazz tones to the bone-crushing Insane. Access to all the tones that every guitarist wants. Fine-tune all your tones with the front-panel 3-band EQ that includes Bass, Mid, and Treble knobs. Carve out the middle, roll off the highs and lows, and sculpt till your tones are just right. Need some grit? Grab the dedicated Drive knob to pile on as much distortion as you need. Give your clean tones a little bite. Make your dirty tones filthy. You can even roll back the Drive to clean up your crunchy tones for a classic mid-gain sound. Balance the volumes of your presets quickly and easily with the Channel volume knob. Make sure your high-gain lead tones don't blow away your cleaned-up rhythm tones. Just set them and forget them. 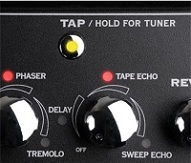 Smart FX knobs put award-winning Line 6 effects at your fingertips. Easy to use, Smart FX let you spend less time tweaking and more time playing. Easily add or remove any amount of lush reverb, exceptional echo, tangy mods, and more. The knobs are located on the amps front panel, so you can make all your adjustments on the fly. Add color and texture to your tone with the six Smart FX knobs on Spider IV 15: Chorus/Flange, Phaser, Tremolo, Sweep Echo, Tape Echo, and Reverb. Add color and texture to your tone with the six Smart FX settings on the Spider IV 15. Sync time-based effects with Tap Tempo. And with Tap Tempo, sync up your effects like a pro. With two pushes of the Tap Tempo button, all of your time-based effects will fall in line with military precision. The peaks of your Tremolo will match the feedback of your Sweep Echo, and so on. Create up to four custom-made presets for the music that you play. Save each one to a Channel memory and recall it instantly with the touch of a button. Connect an FBV Express MkII or FBV2 foot controller to recall or scroll your user presets remotely. Spider IV 15 is a wolf in sheep's clothing. It can do something that many other amps can't and that's produce great tone--including scorching high-gain tones--at low volumes. And that makes it ideal for late-night jamming, small spaces, and any place where size, weight, and volume are a factor. To get the whole story of Spider IV amplifiers, you need to turn one around. All Spider IV combo amps feature a perfectly tuned three-quarter closed-back cabinet. This provides a tight, punchy, focused response that you can't get from an open-back cabinet. You'll always sound your best with the built-in tuner. No need for an external tuner or additional guitar cables, this invaluable tool is integrated into the amps front panel. Simply activate the tuner with the push of a button. Spider owners also get free access to Spider Online, a unique online resource offering over 500 guitar lessons, amp tones, jam tracks and more. Watch videos of top artists dialing in their signature tones. Spark new inspiration with jam tracks, drum-and-bass grooves and drum loops played by top session musicians, plus hundreds of downloadable tones. Lessons cover all genres and styles and include tabs, audio samples and tones. Spider Online has something for everyone – and it’s free for owners of any Spider amp, including Spider I through IV, Spider Valve™, Spider Jam™ and Micro Spider™. Guitarists, you know you just want an amp that sounds good and is easy to use. And it'd be awesome if it had multiple tones, you know the classic sounds we've all heard on records forever. And effects! Well, the Line 6 Spider IV 15 is that amp — and better yet, it's crazy affordable! With 15 watts and powered by presets crafted by todays premium tonemeisters, the Spider IV 15 is your tone solution for late night jams, low volume practices, and more. Looking to record? use the direct out to pipe your favorite tones straight into the mixing board or interface. The Spider IV 15 might be small, but it's loaded with the stuff that makes guitarists salivate!